A sit by fire kind of weekend is upon us. Our gorgeous summery weather was not meant to last. It's Spring in Alberta, so we all knew it was too good to be true. That's ok. I'm hopeful that the cold might kill of some of the mosquitos that have already been making their presence known. I thought I'd share a recipe for a quick but delicious meal - something you might make for lunch on a lazy weekend like this. Making it ahead of time means you can just pull out the salad mixture and toppings, and let people assemble their meal when they're ready. You can make this as either a chicken or tuna salad, depending on what you have handy and what you'e feeling like. I got this recipe from the Parsley Sage Sweet blog (click here for the original! ), and below is my take on it. Mix the dressing ingredients and set aside. Combine the salad ingredients in a large bowl (except the avocado, lettuce and wrap), and add dressing to taste. Cover and refrigerate for at least 2 hours or overnight, allowing the flavours to meld. Heat your tortillas - I liked to toast mine right over the open flame of my gas range. 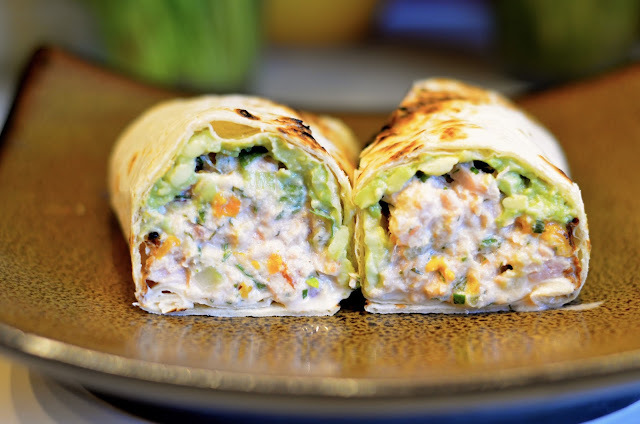 You can microwave them for a few seconds or heat them in a pan, but whatever you do, you want pliable wraps! Layer your toppings into a prepared wrap and dollop on a generous helping of salad. Roll up and serve!